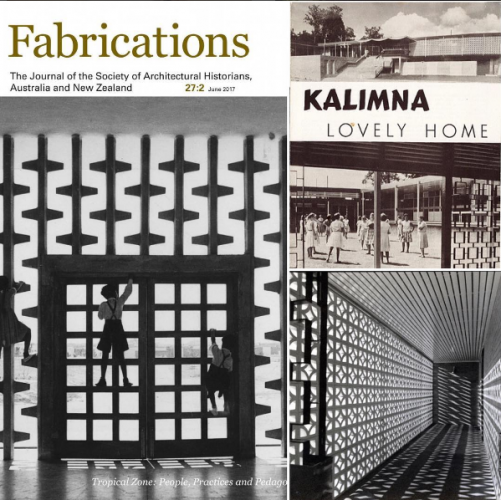 Fabrications: The Journal of the Society of Architectural Historians, Australia and New Zealand invites papers for a special issue (Vol. 29, No. 2) on Industry + Architecture edited by Anoma Pieris and Mirjana Lozanovska. Papers are due by 10 October 2018. See below. Complex and mechanised, industrial architecture altered the aesthetic and cultural landscape of places. It also contested the normative divisions between structure, form and ornament. This issue of Fabrications seeks to explore the nexus between industry and architecture by raising a broad range of questions regarding the aesthetic, social and political impact of industrial processes, construction practices, labour and materials on built environments directly linked to industry. It asks how industrialisation has modified our experience of urban and rural spaces and seeks knowledge of its continuing and residual affects. This issue is interested in the role of industry in constructing and contesting the differential map of modernisation across the geopolitical world; in the colonial and transnational dimensions of industrial architecture including the cultures that it produced, and other unprivileged social environments that have evolved due to industry. It is interested in the legacy of industrial architecture, and its place in heritage discourse. This issue anticipates papers on the architectural histories of colonial industrial spaces and landscapes with their asymmetrical labour relations, postwar nation-building, including immigrant networks associated with industry, and postcolonial national developments. It is particularly interested in the interface of histories of modernisation and histories of industry, including export architecture during Cold War political contestation, and its impact on the developing world and newly formed nations. It is also interested in the soft industrial environments of neo-liberal economic expansion. We seek examples from a broad range of industrial sectors including agriculture, mining, transportation, military, and heavy industry that engage architectural expertise in complex and unorthodox ways. We are interested in historically specific well-researched case studies as well as comparative and theoretical framings of industry and architecture. We encourage contributions that include peripheral, rural and remote environments, urban environments, non-elite practices and populations, and gritty ephemeral spaces that are typically excluded from architectural histories. We are particularly interested in, but not limited to, contributions on the histories of industrial architecture in Australia, New Zealand and the broader Asia Pacific region. Studies of industrial complexes, worker housing, high tech and offshore manufacturing environments are also welcome. Papers should be submitted online at www.edmgr.com/rfab by the due dates identified above.